Raith Rovers winger Daniel Armstrong is hoping to make a name for himself in his homeland after returning from a three-year spell south of the border. The 21-year-old recently moved to Stark’s Park on a short-term deal until January, ending several months without a club following his release by Wolves in the summer. The young Scot certainly made an impression in only his second start for the Kirkcaldy side, scoring a double in a 3-1 win at Stenhousemuir on Saturday, including a long-range stunner in a performance that earned him the Star Man award in the SPFL Team of the Week. “That’s my first two senior goals, and not a bad time to do it in my second game,” he said. “I’m just delighted to get off the mark and hopefully they keep coming. “I was out the game for a long time after I left Wolves – a good few months, so I just wanted to get back playing football and I think this is a great place to come do it. Armstrong was just turning 18 when Wolves plucked him from the Hamilton Accies youth system on a three-year contract, but despite becoming a mainstay in the club’s youth sides, he was unable to break into the first team at Molineux. He had a brief loan spell with Dunfermline Athletic in the Championship last season, where his opportunities were limited mainly to substitute appearances. Armstrong also spent part of preseason on trial with Coventry City, playing 45 minutes in a first team friendly, but when his hopes of landing a deal in England fell through, it was time to return north, with Raith prepared to offer him a chance. “I knew I wasn’t going to be staying at Wolves, and I didn’t particularly want to be there either,” he said. “I want to play first team football and I knew with everything going on there I wouldn’t be playing in the Premier League right now. “I had a few options down there at first, then a load of complicated things happened, now I’m just delighted to be here playing football. Despite failing to realise his ambitions at Wolves, the youngster remains grateful for the experience at one of England’s biggest clubs. “When I first went down it was with the ambition of being a first team player,” he said. “I had options in a load of places and I chose Wolves because they had the intention of putting me in the first team. “But the year after moving there they got bought by crazy owners and they had all the money in the world, which made it difficult for us young players to get through. “I don’t regret anything. It was a good experience, and the best facilities you can imagine. 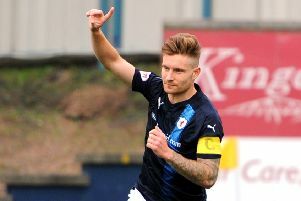 With two games and two goals under his belt, Armstrong had told Raith fans there is more to come as he builds up his match fitness. “I’m building up and working hard in training every day,” he said. “I hope I keep starting, and keep getting my fitness up, because I’m not fully match fit and as sharp as I can be.